3 The Lilac Lady (Painted ladies three HO scale) Discounts Applied to Prices at Checkout! The Lilac Lady Painted Lady Pattern comes in Laser and Router Version. The Laser Version comes in 1/2", 1/4", 1/8" and 1/16" and 1.5, 3, 6 and 12mm sizes. The Router Version comes in 1/2", 1/4" and 1/8" and also 3, 6 and 12mm sizes. The 1.5 and 1/16" are exact to HO Scale but we created the Router Version with dogbone fillets for enthusiasts who would like larger versions for Dollhouses or other similar purposes. "Painted ladies" is a term in American architecture used for Victorian and Edwardian houses and buildings painted in three or more colors that embellish or enhance their architectural details. 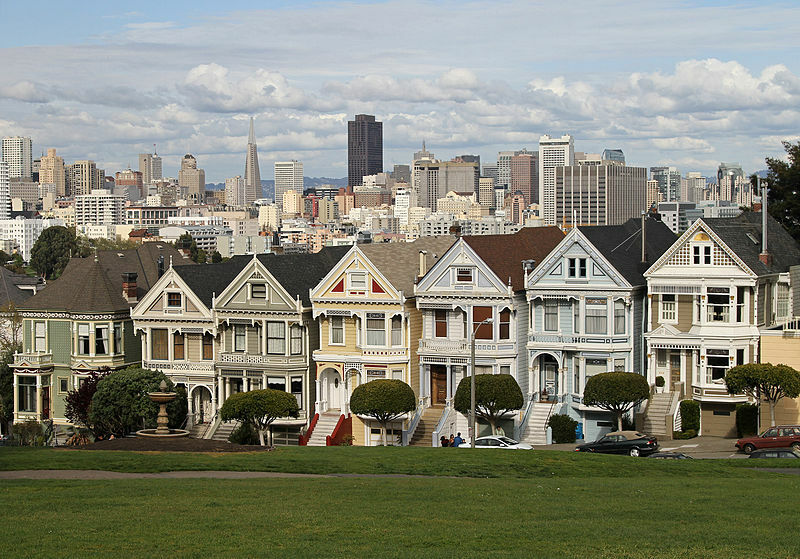 The term was first used for San Francisco Victorian houses by writers Elizabeth Pomada and Michael Larsen in their 1978 book Painted Ladies - San Francisco's Resplendent Victorians. Since then the term has also been used to describe groups of colorful Victorian houses in other American cities, such as the Charles Village neighborhood in Baltimore, Lafayette Square in St. Louis, Missouri, the greater San Francisco and New Orleans areas, Columbia-Tusculum in Cincinnati, The Old West End in Toledo, Ohio, and the city of Cape May, New Jersey. About 48,000 houses in the Victorian and Edwardian styles were built in San Francisco between 1849 and 1915 (with the change from Victorian to Edwardian occurring on the death of Queen Victoria in 1901), and many were painted in bright colors. As one newspaper critic noted in 1885, "...red, yellow, chocolate, orange, everything that is loud is in fashion...if the upper stories are not of red or blue... they are painted up into uncouth panels of yellow and brown..." While many of the mansions of Nob Hill were destroyed by the 1906 San Francisco Earthquake, thousands of the mass-produced, more modest houses survived in the western and southern neighborhoods of the city. During World War I and World War II, many of these houses were painted battleship gray with war-surplus Navy paint. Another sixteen thousand were demolished, and many others had the Victorian decor stripped off or covered with tarpaper, brick, stucco, or aluminum siding.In 1963, San Francisco artist Butch Kardum began combining intense blues and greens on the exterior of his Italianate-style Victorian house. His house was criticized by some, but other neighbors began to copy the bright colors on their own houses. Kardum became a color designer, and he and other artists/colorists such as Tony Cataletich, Bob Buckner, and Jazon Wonders began to transform dozens of gray houses into Painted Ladies. By the 1970s, the colorist movement, as it was called, had changed entire streets and neighborhoods. 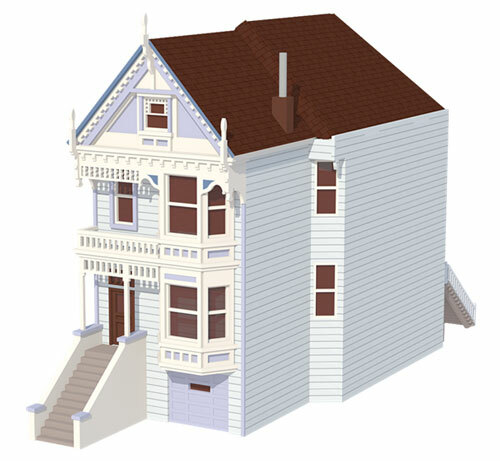 This process continues to this day.One of the best-known groups of "Painted Ladies" is the row of Victorian houses at 710–720 Steiner Street, across from Alamo Square park, in San Francisco. It is sometimes known as "Postcard Row." The houses were built between 1892 and 1896 by developer Matthew Kavanaugh, who lived next door in the 1892 mansion at 722 Steiner Street. This block appears very frequently in media and mass-market photographs of the city and its tourist attractions and have appeared in an estimated 70 movies, TV programs, and ads, including in the opening credits of the television series Full House.The C. A. Belden House, a Queen Anne Victorian in the Pacific Heights section of San Francisco on Gough Street between Clay and Washington streets. The house is on the National Register of Historic Places.In 2010, 722 Steiner St. was put up for sale, at the asking price of $3,999,999. It is located on the corner of Steiner and Grove. It was the first time in thirty-five years that 722 Steiner St. had been for sale. It has been called the oldest, largest, and most detailed of the seven sisters.In December 1993, 710 Steiner St. sold for $575,000. 712 Steiner St. sold for $920,000 on Nov. 4, 1998 and again for $1,250,000 on Nov. 15, 2001. 718 Steiner St. sold for $55,000 in 1974. 720 Steiner St. was sold on Aug. 16, 1996 for $650,000 and again on Aug. 24, 2001 for $1,210,000. 722 Steiner St. sold for $65,000 in Feb. 1976. Collect your Beautiful Painted Ladies Today! This Lilac Lady Painted Lady Pattern and its instruction guide, its design and assembly methods are all Copyright makeCNC. If you purchase this pattern and would like to reproduce it you may only reproduce up to 50 real products from this individual pattern. If you would like to reproduce more than 50 then you would need to purchase another Lilac Lady Painted Lady Pattern at $8.50 again. You could then produce another 50 real products. You would have to purchase a new pattern for every 50 you would like to produce. Otherwise, if you wish to mass produce this product please contact us at makeCNC to negotiate a commercial license.